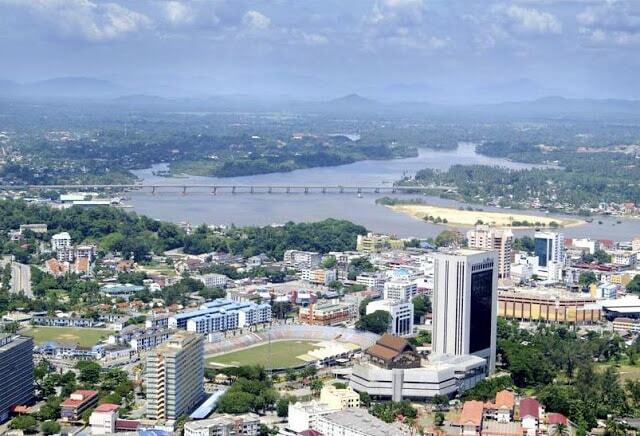 This city is located at the Terengganu River and is the capitol of the State Terengganu. The city is located a mere 20 minutes drive away from the airport, but when you arrive by car it will be your second stop at the East coast. In front of Kuala Terengganu, right in the South China Sea are the islands Pulau Kapas and Pulau Rendang. The islands are renowned for its clear waters, sandy white beaches and swaying palms. Home to an infinite variety of hard and soft corals, the waters around the islands are abound with sea-shells, fish and turtles. The islands laid back atmosphere is ideal for relaxation but the more adventurous will find it is also a haven for swimming, snorkelling, windsurfing, kayaking, boating and fishing. To take the boat to Pulau Kapas you have to go Marang, South of Kuala Terengganu. This fishing village is famous for its sweeping scenery. Beauty and function converge in the rows of colourful, elegantly carved fishing boats moored on the sparkling waters. By bus it will take 30 minutes to come to Marang from Kuala Terengganu and the speedboat will bring in 15 minutes to Pulau Kapas. This jetty goes from 9 in the morning till 5/6 in the late afternoon. Remember: m-A-rang you go to k-A-pas and m-E-rang you go to r-E-dang. Rantau Abang (60 km from Kuala Terengganu) is a place where the turtles come ashore to lay eggs. This coast is one of the few leatherback nesting sites in the world. Turtle sanctuaries have been established in an effort to reverse the decline of leatherback turtles. Collection (except by licensed turtle egg collectors) or eating of turtle eggs are forbidden. Visitors who want to see the turtles have to be alert quietly from midnight to dawn to watch the memorable sight of these Giant Leatherbacks laying their eggs. These giant turtles, up to 2.5 meters in length and sometimes weighing more than 375 kg is indeed a phenomenal sight to behold. Rantau Abang is one of only six places in the world visited by these turtles, from the months of May to September. If you want to go to Pulau Redang, then you have to go Kuala Besut in the North of the State. That's also the kampong, where you can take the jetty for the Perhentian Islands. You can also leave from Merang to Pulau Redang. Sea. It has beautiful beaches and the resorts has a "turtle watch" at night between May and September when the turtles visit the beach to lay eggs. Just tell the reception, that you want to be called, if they have spotted a turtle coming on the beach and they will phone you at night in your room. A little van will take you to the right place on the beach. People at the East Coast consider eating this delicacy of the ping-pong to tennis ball sized eggs as a tradition. The lure of sea turtle eggs has spawned a collecting frenzy, treating them like buried treasure, because of the good prices fetched in the local markets. With buyers shelling out one or two ringget for each egg, depending on the species. A collector can haul in a small bonanza with each nest averaging between 80 to 140 precious pieces. Unfortunately, the strong demand for these appetizers has lead to the over-collection and over-consumption of all types of sea turtle eggs due to illegal harvesting and sale by non-licensed locals. Unfortunately we could buy turtle eggs on the Central Market in Kuala Terengganu! Terengganu State Museum Complex. consists of a Main Museum, a Maritime Museum, a Fisheries Museum, 4 traditional houses and botanic and herbs gardens. The Main Museum is built on 16 stilts, in accordance with the traditional architecture of Terengganu. Its 4 blocks are adjoined, to represent a big family. There are ten galleries showcasing textiles, crafts, historical, royal, nature, art, petroleum, Islamic, new generation and contemporary arts. Sutera Semai Centre is at Chendering (6km south of Kuala Terengganu). It is Malaysia's pioneer silk weaving center, where visitors can witness different stages of silk manufacturing. There, witness the painting of batik designs onto the fabrics, resulting in beautiful batik shirts, kaftans, scarves, handkerchiefs, etc. Bukit Peturi, is a 200 m high historical hill, situated next to Istana Maziah. It was used as a fortress between the years of 1831 to 1876 to defend the state from enemy attacks. Some of the historical remains which can be seen on Bukit Puteri are cannons, a flagpole, a large bell and a fort. Today, as it is the highest point in Kuala Terengganu, visitors standing on top of Bukit Puteri can witness the magnificent view of the areas sur-rounding it. Istana Maziah. is believed to have been constructed during the reign of Sultan Zainal Abidin III. It was built in 1897 and it is the venue for royal birthdays, weddings, conferment of titles and receptions for local and foreign dignitaries. A product of the blend between splendid modern and traditional architecture, it is also well-known as one of Malaysia's cultural attractions. Central Market or locally known as Pasar Payang which is located by the Terengganu River is one of the most popular tourist spots in Kuala Terengganu. Housed in a modern building complete with a shopping arcade and a car park, it offers visitors a variety of traditional handicrafts such as batik, silk, songket, brocade and brassware, other fresh produce such as fruits, vegetables and 'Keropok Lekor', which is a special local delicacy made from a mixture of fish and sago. Visitors to this market will have a delightful experi-ence shopping in local fares at reasonable prices. Desa Craft. formerly known as Usaha Desa, is an interes-ting handicraft centre which showcases songket, brassware, batik, souvenir items and also fashion wear of current batik designs. Pulau Duyung is the most well-known boat building ground in Terengganu. There, you can see boats being made by skilled boat builders who implement skills which have been passed down from generation to generation. Boat building is an art form therefore the boat builders take pride in their skill. The boat builders are unique, for they work entirely from their memory and experience, and without any set plans. Pulau Duyung is also renowned for its dried and salted fish, and fish crackers industries. It is easily accessible by the Sultan Mahmud Bridge, or for those who enjoy using sea transportation, take a boat from the Kuala Terengganu waterfront. Malaysian Handicraft Centre in Chendering ( 6km).The centre offers visitors a wide variety of Malaysian handicraft and also an insight into handicraft making. Some of the exquisite items which can be found here are songket, batik, vases, and mats, hats, wallets and bags made from pandanus leaves. Visitors will also get a chance to witness first hand the skills of local artisans in songket weaving, batik painting, basket weaving, etc. By booking through this non commercial site, you'll keep this site alive! The prices of different websites are compared! Situated on Kuala Terengganu's stunning beach, this 4-star property is designed with an intricate blend of Eastern and Western influences and offers a family-friendly beachfront ambience. The resort, a short drive to the city center, offers 245 modern rooms, each with its own attached balcony overlooking the beautiful South China Sea. Guests can sit by the sea and dine under the stars at the restaurant, partake in a variety of recreational and water sport facilities, or relax by the lagoon-shaped swimming pool. 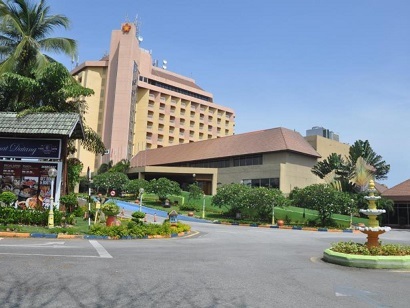 This property is within close proximity to Terengganu State Museum and Sultan Mahmud Airport. Whether you are a leisure or corporate traveler, you will be pleased to know that Primula Beach Hotel is just a stone's throw away from the business hub and places of attractions in town.